Andy’s flying solo today, so it’s an abbreviated look at the lessons learned from Tony Robbins #MeToo scandal. Tony Robbins faced a reputation crisis after challenging the motives of the #MeToo movement. Andy Beal: Okay, something a little bit different this week. Unfortunately, Erin can’t join us. She has a personal matter to attend to, but I have promised a few of you that I would jump in and talk about Tony Robbins. So, this is going to be a mini-podcast, a mini-episode this week. For those of you not aware, Tony Robbins is … you know, he’s our figurative reputation roadkill. There’s a video showing him saying that women use the MeToo movement to gain significance, and that many Hollywood executives he coaches are now refusing to hire attractive women, believing the risk is too great. And this video from a few weeks back has circulated, and Tony Robbins has had a lot of reputation issues because of this. He’s had to apologize. And this has definitely been a serious crisis for the author, the personality, the life coach, whatever you want to call him. You know, looking at this, I just wanted to kind of help us to learn from this, and it’s something that I am aware of as being an expert. And that is, when you become an expert on a topic, when you become a leader in your industry, you become susceptible to arrogance and hubris. You start talking in absolutes. You think that you know everything, not just on your expert matter, your subject matter, but on related things, too. So when this subject came up with Tony, you can tell that this kind of overlapped a little into what he thought was his lane, if you like, as a life coach, and you know, he wanted to demonstrate that he was an expert. I kind of get the feeling, though, that he just didn’t understand it. And if you look at his apology, he admits he’s got a lot to learn. So, in hindsight, he shouldn’t have talked about this in absolutes, by saying that these women were trying to gain significance. Which, if you look at the MeToo movement, that’s not really what it’s about. This is why I have not really commented on this movement, about how it’s affecting reputations, because it’s clear that there are a lot of evil men out there doing evil things to women, and these women are coming forward, and they’re brave to do so. That’s all I know, so that’s all I’m going to say about the topic. And perhaps that’s what Tony should have said. The other thing is, when you become like this larger than life personality, people want to attack you. You become a target for criticism. If this had been just an everyday person making a comment about this, it would have gotten a little bit of attention. But because he is this big mega-star that’s, you know, probably … I don’t know if he’s a billionaire, but he’s certainly made hundreds of millions of dollars … there are people that are out there that are ready to attack him, and listening to his words closely. So, the other thing I wanted to talk about as well, is his apology. Now, his apology did check all the right boxes. He didn’t do the, “I’m sorry if people felt offended,” that kind of stuff. It seemed like a sincere apology. But what I didn’t care for is that he didn’t make the apology until a number of days later, and he had seen the damage his original comments were making to his reputation, to his brand. He should have let his conscience lead him to apologize, not the pressure from social media. The longer you wait, the more fuel is added to this fire. The more … really insincere it can appear. Even when you say all the right things, if it takes days for you to apologize, it comes across that you’re only apologizing because you’re trying to clean things up, and you’re trying to make it all go away. I think there’s definitely a strong part of that with Tony Robbins’ apology. It took him days to respond. He should have known early on that he had made a mistake. Honestly, saying that women are going to hurt themselves because now they’re not going to get hired because men are fearful of hiring attractive women. Oh my gosh, the moment the words left his mouth, he should have apologized. That’s not something you sit on and wait. So clearly, there’s an aspect here of waiting for this to see how this pans out, and he waited too long. He’s definitely going to recover from this, but there’s going to be scar tissue. You know, he’s still going to sell lots of books, he’s still going to sell out the audiences, but there will always be this question hanging over him. It’ll probably make his Wikipedia profile, it’ll probably show in the top 20 of Google, and there’ll be something there that lingers and it’s going to hurt him. So what can we learn from this? Because there is some takeaways here. Now, again, these are not absolutes, right? So if I had Erin here, she would chime in as well. This is why we have two people on this show normally, because I don’t ever want to think I have all the answers. But I think it’s safe to say that if you get feedback from your customers, your stakeholders, your friends even, that you are wrong, or maybe that your product is poor, or that you’ve lost a step in terms of the service you provide, just because you are top of your game, don’t assume they are wrong. The other thing as well, is certainly when it comes to online, don’t talk about topics that you don’t understand. Stay in your lane. Especially if you’re the leader of your company, or a spokesperson for your company, it’s going to be really hard for you to separate your personal opinion with your expert opinion, and so when you start making these statements about things that are not your expertise, then you run the risk of saying something that you don’t know. You know, you kind of don’t have all the facts, you misrepresent something … I don’t know, you just kind of drift out of your lane, and you can come under fire. There are plenty of topics that I don’t cover. We don’t talk a lot about politics, we don’t talk a lot about social issues, because I don’t understand them enough. If I was to take on a client with a reputation issue like that, I would spend weeks researching the topic before I even consulted and worked with the client on how best to address the situation, or to talk to it. So, making an ad lib, off the cuff comment is potentially going to be damaging to you. There you go, just a quick episode this week. We’d love to get your thoughts on what you think Tony Robbins did wrong, if there’s anything I’ve missed, what you think he can do now to repair his reputation, whether you agree with my comments or not. Again, I always try to come at this from an understanding that I don’t have all the answers, but hey, let’s discuss it. Go to our Facebook page, Facebook.com/andybealORM. And then andybeal.com, just go to any blog post and leave us a comment. Erin hopefully will be back with us next time, and we hope you’ll join us then. Thanks a lot, and bye-bye. 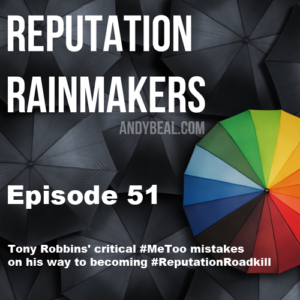 Share the post "#51 – Tony Robbins’ critical #MeToo mistakes on his way to becoming #ReputationRoadkill"